Lavazza - Lavazza Perfetto Espresso Roast Ground Coffee Ground - Compatible with French Press - Caffeinated - Arabica Perfetto - Dark - 12 oz Per Bag - 1 Bag 7511 LAV7511 pg.426.
. - Caf&eacute; Bustelo Espresso Ground Coffee - Caffeinated - Espresso - Dark - 36 oz Per Can - 1 Each 7447100055 FOL00055 pg.429. Lavazza - Lavazza Coffee - Caffeinated - Espresso - Full Extra Dark Extra Bold - 35.2 oz Per Bag - 1 Bag 4202 LAV4202 pg.427. 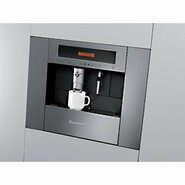 Generic - Ariston Built-in Coffee Center Transform your kitchen into a true Italian style caf&eacute; with a built-in espresso coffee center that also brews delicious cappuccinos lattes tea and hot water.